The traditional view has been that language primarily involves two core areas in the left inferior frontal and superior temporal cortex. these were considered modules for language production and comprehension, respectively (Lichtheim,1885; Geschwind, 1970). With the advent of neuroimaging, however, the evidence became overwhelming that, apart from classic core language areas, multiple supplementary areas are also active during language processing, suggesting widely distributed corteial system as the basis of language in the brain (Pulvermuller, 1996...). -Pulvermuller et al. 2005, p. 794. Many of Friedemann Pullvermuller's papers start out with a statement, such as that above, which contrasts the old-school "modular" 19th century models of Wernicke and Lichtheim, with "modern" distributed accounts. I've commented on Pulvermuller's misrepresentation of the classic view on semantics in a previous post. Now that I've had to read, several times, how the modern distributed account contrasts so sharply with the classical view, I think it is time to point out that the proposed model of Pulvermuller is identical to that proposed by Wernicke and Lichtheim. 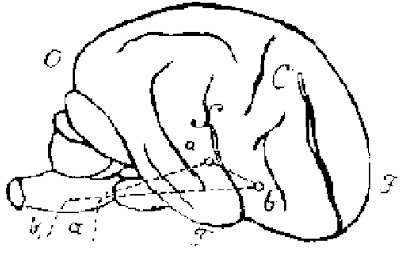 ...let a be the central termination of the acoustic nerve... Let b stand for the representation of movements in the cerebral cortex which are necessary for the production of sound, connected with a by association fibers ab..."
The entire region of the first convolution, which circles around the fossa Sylvii serves in conjunction with the insular cortex as a speech center. The first frontal convolution, which is a motor area, is the center of representations of movement; the first temporal convolution, a sensory area, is the center for sound images. So Wernicke actually proposed a more distributed region of perisylvian cortex as the seat for sensory and motor word images than Pulvermuller proposes for his homologous phonological word forms (if we take Pulvermuller's figure literally). ...the use of these pathways, i.e., the ready transmission of excitation along them, is no accident; rather it can easily be demonstrated that two places in the brain that have once functioned together regularly remain associated. 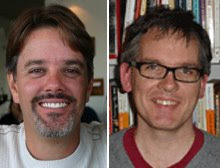 So the idea is that the "pre-semantic" phonological aspects of a word are stored in Broca's and Wernicke's area, whereas the concepts that these words refer to -- their visual and motor associations, for example -- are stored in a distributed fashion in other areas according to the type of associations these words have. … the memory images of a bell … are deposited in the cortex and located according to the sensory organs. These would then include the acoustic imagery aroused by the sound of the bell, visual imagery established by means of form and color, tactile imagery acquired by cutaneous sensation, and finally, motor imagery gained by exploratory movements of the fingers and eyes. (Quoted from Gage & Hickok, 2005). 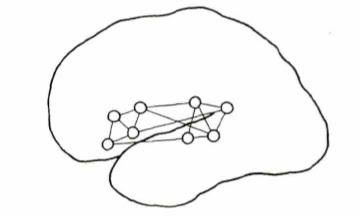 Though in the diagram B is represented as a sort of centre for the elaboration of concepts, this has been done for simplicity's sake; with most writers, I do not consider the function to be localised in one spot of the brain, but rather to result from the combined action of the whole sensorial sphere. (p. 477). Lichtheim's Figure 7 in the same paper illustrates this distributed model. Notice the distributed nature of the conceptual representation, just like Wernicke and Pulvermuller. So despite claims to the contrary, Pulvermuller's model of the functional anatomy of language is essentially a recapitulation of the classical model. The only difference seems to be in the number of circles that are drawn in the graphic depictions of the respective models. Wernicke, C. (1874). The symptom complex of aphasia: A psychological study on an anatomical basis. Very nice. These old neurologists were a lot more sophisticated than they are usually given credit for, obviously because very few people actually read their work. I have some sympathy with Pulvermuller as I bet many undergraduate general psychology lectures still push the simple idea of 'core language' areas for production and comprehension in the brain, and I bet many people working in neuroimaging now in areas other than language still believe this. If he's trying to present his work to a general audience it's important to get the idea across that it's not as simple as Broca's area/Wernicke's area, but there's no reason for him to claim that Wernicke, Lichtheim etc. ever thought it actually was that simple (although from what I've read of his, Broca maybe did think it was, at least for 'the articulation of words'). Thanks Greig! I've updated the entry with the original figures. Tom, It is true that many people misunderstand the classic theorists in our field. But if you are going to hold up their theory as the standard against which you are going to argue, and you are going to do it repeatedly in high profile journals, you better read the original papers and get it right. Further, Pulvermuller even gets modern authors wrong on this same issue, including Hickok & Poeppel who have (despite what Friedemann says) argued for widely distributed conceptual representations. Regarding Broca, I agree: his views seemed to be very phrenological as opposed to the more dynamic and distributed views of Wernicke. First I thought: OUCH! Then I thought: Geez, since when is it bad to be compared (even equated) with Wernicke? We should be so lucky! Anyway, thanks for the historical perspective here. Very helpful reminder that the 19th century folks had rich ideas, and that most of what we do are just footnotes to these original thinkers. for a more elaborate explantion. You are correct our (HP) model is very similar to the classical models in spirit. But both models old and new assume widely distributed conceptual representations. What's ~focal are the binding sites between auditory word representations and those distributed conceptual representations. Clarify something for me. When you say "binding site" do you mean binding site between an acoustic representation of a word and its meaning? Or do you mean binding site between the various sensory-motor components of word meaning, e.g., Wernicke's visual, auditory, and tactile associations with the concept BELL?